The kitchen, with 3-rock fire. I spent a couple of hours today going through the letters I wrote home from Panama when we were in Peace Corps–trying to decide if there’s a book in that mass of experiences. As I went through, I noted that, in almost every letter, there is something about food. 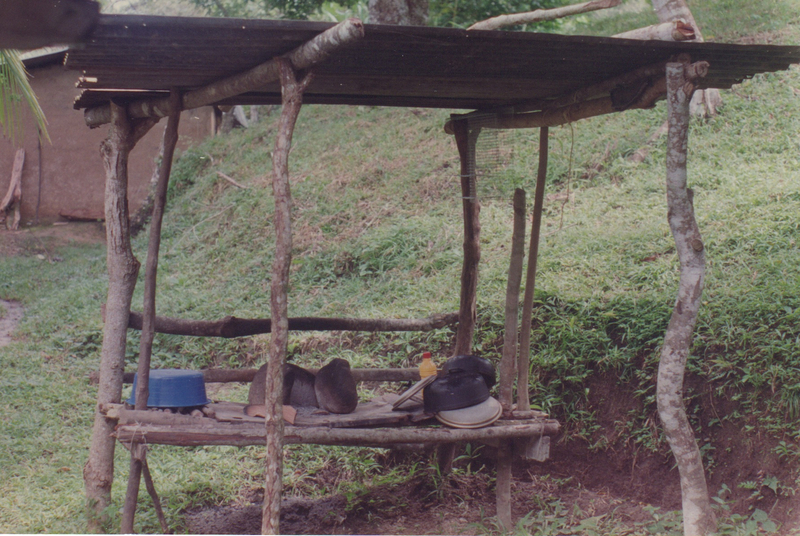 Life in rural Panama was a nutty mix of plenty and famine, luxury and squalor. We had no electricity, and only rudimentary water, but we had fresh hot bread delivered to our door every morning. Sometimes we ate nothing but rice with a spoonful of chutney for dinner, and other times we stuffed ourselves with fresh produce and tropical fruits. We grew to love the local lentils and rice, boiled yuca lightly salted and served with a slice of tomato, and thick sweet oatmeal drink that substituted for a meal in the fields. We perfected the art of straining ants out of the coffee with our teeth. We learned how to make lasagne and pizza on our 3-rock fire. It was a culinary adventure!